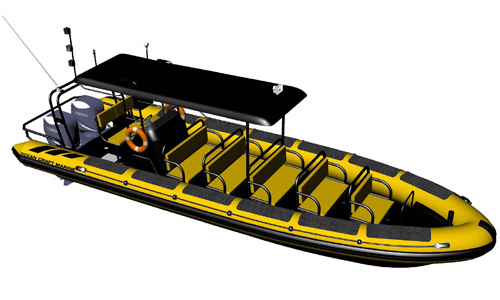 Ocean Craft Marine (OCM) recently received orders to deliver two highly customized 9.5 Meter Tour and Dive Boats through our Hawaii Dealer; Pacific Boats and Yachts, LLC. These USCG Inspected, Subchapter – T, Tour vessels, while being delivered to different customers, are both similarly customized and configured to maximize passenger comfort for seadolphin & whale watching and other eco-tourism adventures. In addition, both vessels are outfitted with dive-platforms and dive-ladders to accommodate recreational diving sorties. Both vessels will be powered by twin Yamaha 250HP outboard motors and have a full suite of the latest navigation and communication electronics. Ocean Craft Marine is very proud to introduce its newest Exclusive Dealer: Pacific Boats and Yachts, LLC (PBY)located in Honokohau Harbor, Kailua Kona,Hawaii. “We are thrilled to be so well represented by Pacific Boats and Yachts in the state of Hawaii, American Samoa, and the US PRIAs (Pacific Remote Island Areas)” said Todd Salus, OCM Vice President. Already named one of Hawaii’s 50 fastest growing companies six times since 2000, Pacific Boats and Yachts, LLC topped previous growth for its boat and yacht sales and ocean recreation consulting businesses again last year, garnering yet another Hawaii’s Fastest 50 Award, according to Rick Gaffney, the firm’s owner and managing brok. 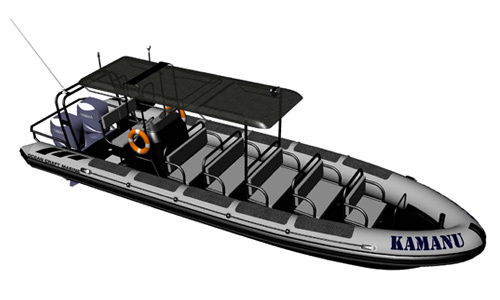 Ocean Craft Marine has developed a new aluminium constructed 12.5 Meter variant called the 1250 Riverine Assault Vessel (1250 RAV). Available in various multi-mission configurations, the OCM 1250 RAV was specifically designed for the stated requirements of our multiple customers in the Gulf Cooperation Council (GCC) Nations and in South America. Ideally suited for near-coastal, inland and riverine environments, the OCM RAV 1250 is powered by twin inboard diesel engines mated to Hamilton Jet final drives and delivers a whopping 880 HP with boat number one testing at an astonishing fully-loaded speed of 42 knots. With Troop seating for 16 and shock-mitigated crewmember seating for an additional four, the OCM RAV 1250 can be configured with a forward or midshipsituatedremovable pilot house. The 1250 RAV is available with a hydraulically actuated bow-ramp for dis-embarking troops ashore and can have up to four crew-served weapons stations supporting heavy weapons such as the M2, MK 19 and the GAU 17 mini-gun. In addition, up to four M7 counter-measure launchers can be fitted on the vessels stern.The RAV 1250 has NATO level 3, mission-modular, Dyneema® anti-ballistic panels which can be deployed to protect embarked assault troops and an anti-ballistic protected pilot house, windscreen, engine compartment and fuel system. The vessel can be rotary-wing and fixed-wing aircraft transportable and fitted with gyro stabilized forward looking infrared (FLIR) cameras.